Information Terrorism: Can you trust your toaster? This 1996 paper won the Sun Tzu Art of War writing award from National Defense University and was published in the peer reviewed “Terrorism and Political Violence” academic journal. The concepts described and recommended in this paper are still referenced today and were seen as a precursor to frameworks on cyberterrorism, the Internet of Things, and Cyber Command. 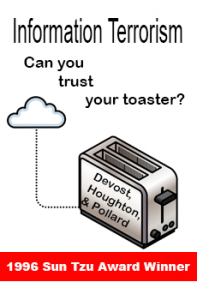 Download: Information Terrorism: Can you trust your toaster?